The major stock market indexes moved higher last week as strong earnings and economic data offset ongoing political risks. Nonfarm payrolls came in much stronger than expected with 250,000 jobs added – compared with a 190,000 consensus estimate – and wage growth of 3.1% came in ahead of the 3.0% consensus estimate. The labor force participation rate also improved two-tenths of a point to 62.9% in a further sign of strength. The Federal Reserve is widely expected to hike rates in December following the ongoing growth in wage inflation. Third quarter corporate earnings have also remained strong. With three-quarters of S&P 500 companies reporting, 78% reported positive EPS surprises, and 61% reported positive sales surprises. Blended earnings growth rates also hit their second highest level since the third quarter of 2010. Price-earnings ratios have also continued to moderate thanks to higher earnings and lower share prices over the past month. 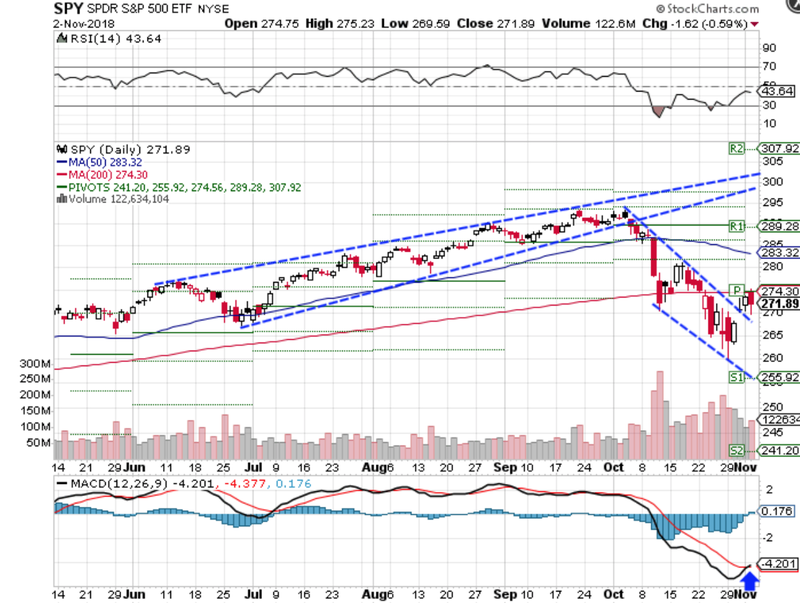 The SPDR S&P 500 ETF Trust (SPY) rose 1.14% last week, breaking out from its downward price channel that began in early October. Traders should watch for a breakout from the 200-day moving average and pivot point at around $274.30 to the 50-day moving average at $283.32 or a move lower back into its previous price channel. Looking at technical indicators, the relative strength index (RSI) returned to neutral levels at around 43.64, but the moving average convergence divergence (MACD) could see a near-term bullish crossover signaling upside ahead. 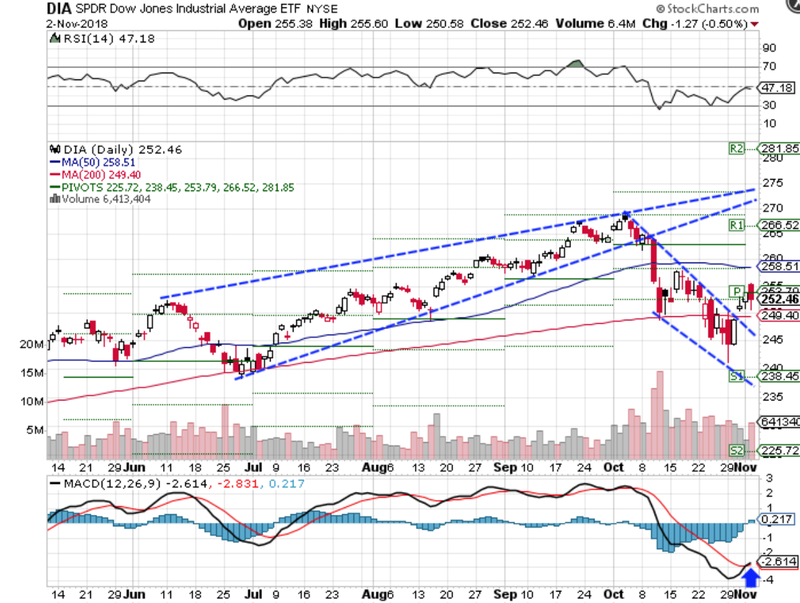 The SPDR Dow Jones Industrial Average ETF (DIA) rose 1.49% last week, breaking out from key resistance levels. Traders should watch for a breakout from pivot point levels at $253.79 toward the 50-day moving average at $258.51 or a breakdown back into its former price channel. Looking at technical indicators, the RSI appears neutral at 48.17, but the MACD could see a bullish crossover over the near term. These indicators suggest that the index could have more upside ahead. 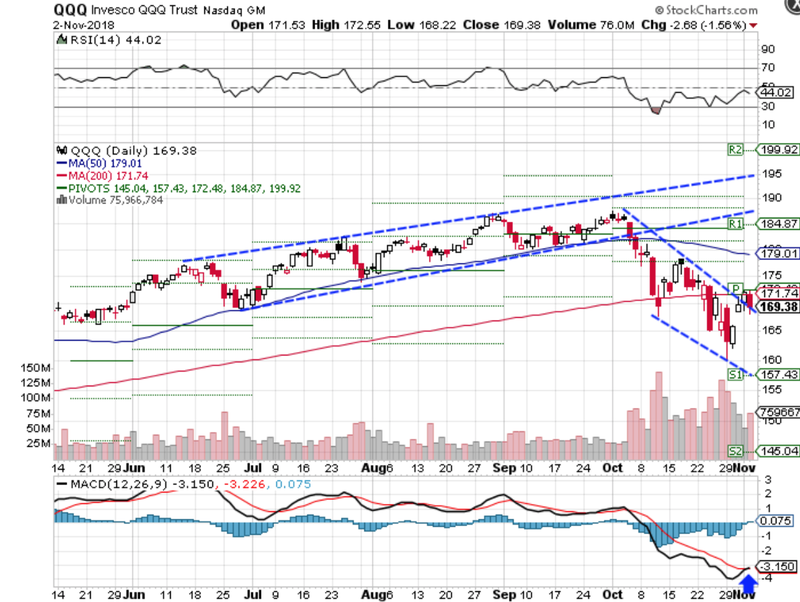 The PowerShares QQQ ETF Trust (QQQ) rose just 0.14% last week amid earnings-driven volatility. Traders should watch for a breakout from pivot point and 200-day moving average resistance levels at around $171.74 to the 50-day moving average at $179.01 or R1 resistance at $184.87 or a breakdown back into its existing price channel. The RSI moved back to neutral levels at 44.02, but the MACD could see a bullish crossover. 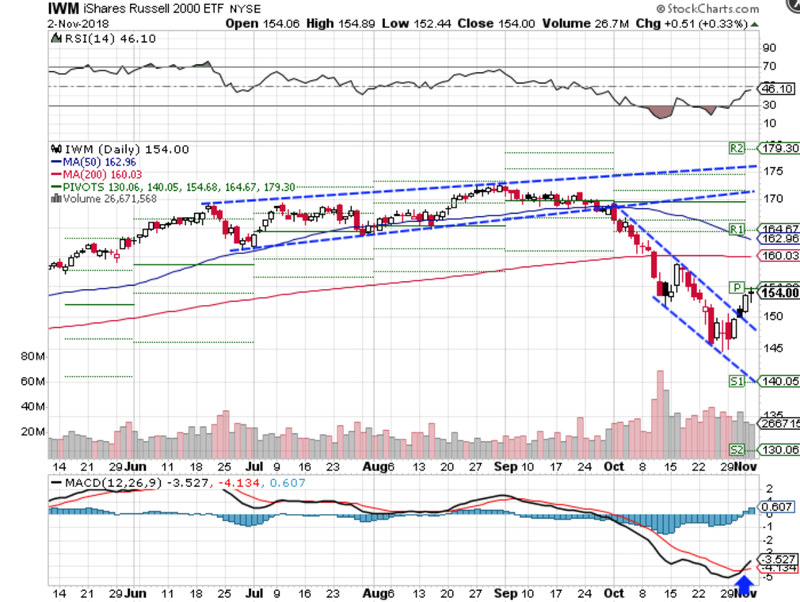 The iShares Russell 2000 Index ETF (IWM) rose 3.24% last week, making it the best performing major index. After breaking out from trendline resistance, the index moved toward the pivot point at $154.68. Traders should watch for a breakout from these levels toward the 200-day moving average at $160.03 or a breakdown back into its price channel. The RSI moved to neutral levels of 46.10, but the MACD experienced a bullish crossover that could signal more upside ahead.